This post is written by Courtney Denning, blogger at Cbus52. You can follow her on Twitter @CourtneyDenning. This is the last in a series of posts on gluten-free dining in Columbus. Columbus has two fantastic and fun bars where you can practice your game skills: 16-Bit Bar + Arcade, located downtown and Kingmakers Board Game Palace in the Short North. 16-Bit Bar offers great drinks and free arcade games for the 21-and-older crowd. The bar serves cool old school cocktails named for male celebrities and new wave cocktails named for female celebrities of 1980s fame. In addition to mixed drinks, 16-Bit also carries small batch bourbon, and bottled, canned and craft beers. The arcade games have handy pedestals next to them for your drink! 16-Bit is located right next to Dirty Frank’s Hot Dog Palace, where you can grab a hot dog and some fries to take with you as 16-Bit does not serve food. All of the current arcade games are listed on 16-Bit&apos;s website, they are organized by which games are on the floor or in the back of the bar. I recommend Donkey Kong, Super Mario Bros., PacMan, The Simpsons, Ninja Mutant Turtles and Frogger. 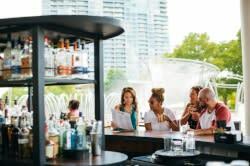 Kingmakers is a family friendly venue which serves beer, wines, specialty sodas, tea, lattes and pretzels from Brezel. 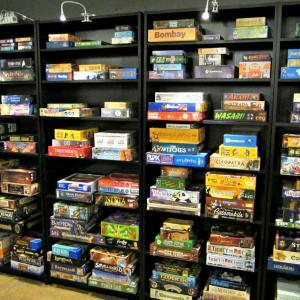 There is a $5 Library Fee per person to play, but it gives you access to over 250 different board games! I saw games I used to play as a kid like Monopoly, Candyland, Trivial Pursuit, Scrabble and Clue. I also saw a TON of games I’ve never heard of like Lemming Mafia, Nuns on the Run, Barista the Game, Merchant of Venus and Those Pesky Garden Gnomes. The staff at Kingmakers, Board Game Sommeliers, will teach you how to play a new game and give you tips. To be a part-time sommelier you must be able to confidently teach at least 30 board games! Check out 16-Bit + Arcade and Kingmakers and get your game on!